as across North America? Do you see yourself as an ambassador for your community? If you’ve answered “yes” to any or all of the above, then your Museum needs YOU! As a wholly non-profit institution, the Art Museum cannot exist without volunteers. Museum volunteers greet visitors, answer phones, help with Museum Shop sales, assist with special events and KidsArt programs and serve as docents at the Museum. They work as many—or as few—hours per week or month as they choose. Click here to submit the Art Museum’s volunteer form today to take the first step to becoming one of our volunteers. Is there any time of they year that you are not available to volunteer? Volunteer Opportunities: Which areas are you most interest in? What volunteer/professional or work experience do you have? 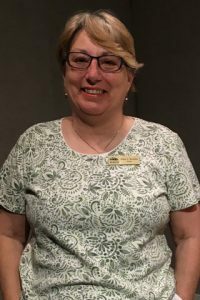 When Saturday visitors to the Art Museum meet volunteer Judy Smith at the front desk, they’re charmed by her warmth and enthusiasm, her positive attitude. What they don’t realize is that Smith is probably one of the luckiest people alive. Just last September, Smith experienced a frightening brush with pancreatic cancer. Treated immediately, with expert medical care — and as she says, “some big-time guardian angels looking out for me” — she came through the experience and, at recent checkups, has been pronounced disease-free. But she also shares some of the credit for her recovery with the Art Museum. 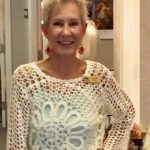 Although she had no art training — she retired from a 32-year career in Loudoun County, Virginia, as a physical education teacher before moving to the Grand Strand in 2011 — Smith had always had an appreciation for the arts. After moving to the Market Common community in 2014, and looking for things nearby to do, she happened to visit the Art Museum with some friends. She has nothing but praise for Museum staffers: their knowledge, friendliness and helpfulness to visitors. “They really work hard to promote art,” she says. That includes the many programs and exhibits geared toward children. One of her first assignments was working on the Tea Porch during the LEGOs-based Art of the Bric exhibition. The area had been set up to allow children to create their own works of art with Lego bricks. “The kids would come in and they’d get so focused on building their masterpieces that some wouldn’t want to leave!” she recalls. I’m a real people person, and I love the people and the work there – although I don’t call it working, I have too much fun. 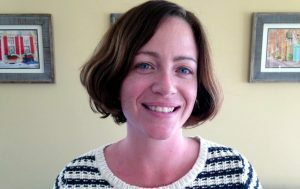 On occasion she has been able to help Education Coordinators Arielle Fatuova with a KidsArt project, and she says she finds it hard to praise “those kids” enough for their creativity and inventiveness.